Today is Summer Solstice, the longest day of the year and one of the Knights of Moleskine, Spirit and Ale official Feast Days. Not that we hold the patent on this holiday. It has been celebrated for eons in our human culture. Nothing quite says Summer Solstice for me as much as a picture of Stonehenge as it reaches towards the sky on the Salisbury Plain. I'm quite fascinated by the structure, how it got there, who built it, etc. There are many theories, stories, legends, myths, but one thing is for certain, it captures the imagination, and for a Knight that is all that is necessary. I remember the first time I came up to the stones on a crisp June morning back in 1979. Back in the States before my journey, I had the scenario all laid out in my mind. I would arrive early to fully investigate and soak in the stones and the surrounding country side. I would walk through them, caressing them, soaking in their centuries of secrets. I would then return at eventide with a bottle of wine and sit in the middle of the stones and wait for the magic to begin. Alas, it was another great story waiting to be told, but it would never happen...at least in reality. I was disappointed to discover that you could no longer walk through the monument or touch the stones. The park closed at night and the only view at eventide was the highway that ran next to it. I did discover; however, a nice pub down the road where I drank great pints of bitter and laughed with the locals about my longing for the stones! Today I find myself again longing for the stones, or rather, longing for the magic they represent on the longest day. It has been a long June at the Wells Castle. Our great hall has been filled with laughter, tears, joy and dread. 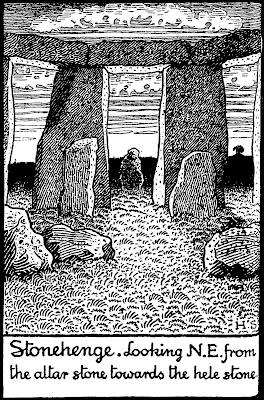 But in the end I raised up this morning with the sunrise and put myself in the center of the stones, just like I imagined on this day back in 1979 and watched the sun rise over the hele stone. It is a great day to be alive, to imagine, to dream, to create magic in our lives! 10,000 people living on the whole island back then.